A favorite ride when I do not have a lot of time available is to drive a loop out through the desert and farms northwest of Tucson. I usually try to check on an old engine and several cold war artifacts while out that way. 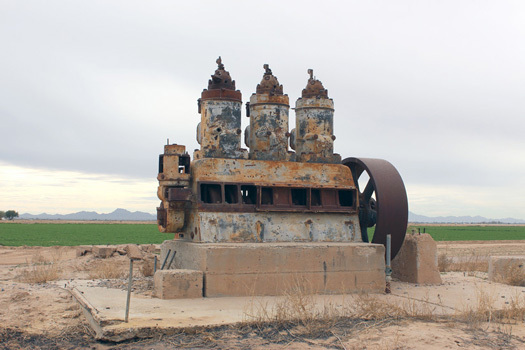 Twenty years ago, there were a half dozen vintage stationary engines scattered around the farms south of Arizona City and west of Picacho. 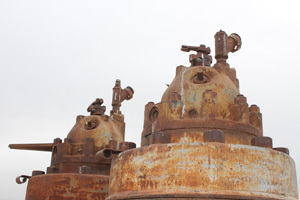 When the price of scrap iron went up a few years ago, most of those old machines disappeared. One still survives. It is located at the edge of a field southeast of Arizona City on Pretzer Road. The engine is a 3 cylinder stationary "diesel" engine. 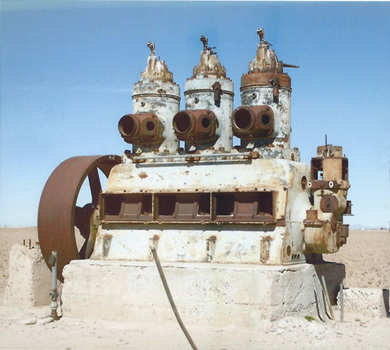 Like many of the other old engines that were in the area, it once powered a water pump. 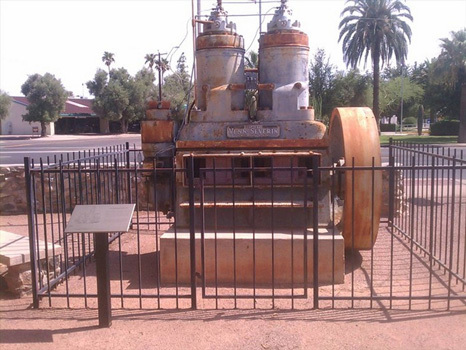 I am not sure of the manufacturer of the engine, but it is very similar to a 2 cylinder Venn-Severin engine that is on display at the Historical Society museum in Casa Grande. Venn-Severin engines were produced in Chicago, Illinois and were known to be very reliable and very economical to operate. The museum's engine dates back to the the 1930's. I would guess that "my" engine is of similar vintage. The ends of the glow plugs can be seen near the tops of two of the cylinders in the photo below. These "plugs" would have been heated by a torch to provide the internal heat necessary to start this old engine. I believe that feature would have classified this old engine as a "Semi-Diesel". "Corona is the name for the first operational space photo reconaissance satellite. 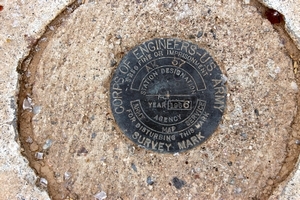 President Dwight David Eisenhower approved the project in February 1958. The project was conceived to take pictures in space of the Soviet Bloc countries and de-orbit the photographic film for processing and exploitation". The composite photo below made-up from several Google Earth views shows a very small portion of the grid. These particular targets were among the first that we noticed many years ago as we made our way across the area looking for old farm equipment/engines. After my most recent trip, I was online to refresh what I knew about the Corona Project. At this new site, the author presents a very interesting and detailed description of the grid and the targets. He has an accounting of each of the crosses that once made up the target area! The old engine lies just outside the southeast corner of the target area. We learned from the website referenced above that the grid extended from there northward to Casa Grande and westward out onto the Tohono reservation. 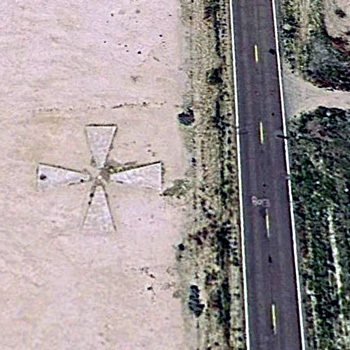 The individual crosses are about 60 feet across with each arm measuring 25 feet in length. In the center of each cross, there is a brass monument that includes the date the cross was constructed, the agency responsible, and the position of the cross in the overall grid. One of the arms has a small cylindrical vault. It does not seem to be known for sure what the purpose of the vault was. The photos below are gound views of the cross in the lower right corner of the photo above. The target is at the intersection of Nutt Road and Overfield Road. 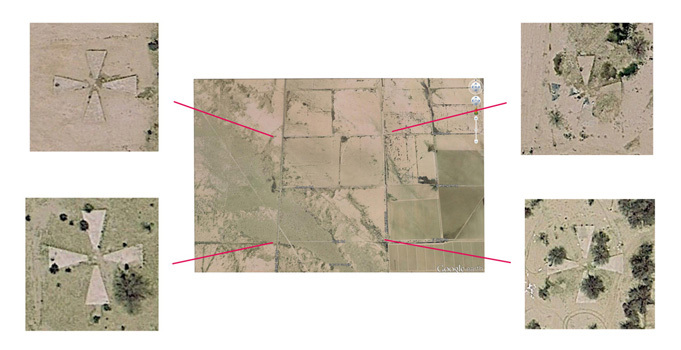 The photos below are the ground view of the cross located in the lower left corner of the composite photo above. It is at the intersection of Sunland Gin Road and Nutt Road. 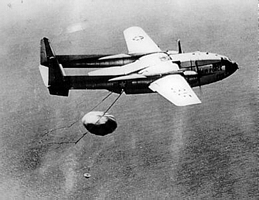 This photo from Wikipedia shows an aircraft snagging the parachute of a film canister returning to earth from one of the spy satellites. As the "BornTourist" website indicates, many of the target crosses remain. As the area develops however, they do disappear. I remember several that are no longer there--especially along Interstate 8.